It’s important to remember that swimming is a life skill that should be taught to all children. Taking extended seasonal breaks can set your child back, and with all of the facilities with indoor pools, it isn’t necessary to wait for summer. In fact, a key factor is repetition. Children need to maintain and reinforce skills, not only math and reading, but exercise, also. Summer swimming lessons will end up going to waste as your child will lose their feel for the water both physically and psychologically. It is particularly important for an infant, toddler or pre-school aged child when long-term retention and muscle memory are starting to develop. Once late spring is here, everyone in their playgroup is registering for swimming lessons. Those classes usually have higher class size ratio. If you are fortunate enough to live in a community with an indoor pool, like the YMCA, take advantage of it. Do some investigating to find a class schedule that fits into your daily routine. In previous posts, we’ve discussed ‘winter swimming myths’, but want to re-emphasize that wet hair doesn’t cause your child to become ill. Viruses don’t breed in our hair, so if their hair gets wet, they won’t suddenly get sick, even if they go outside with a damp head. You may be surprised by that, but it’s true. Higher fitness levels gained through year-round swimming build stronger immune systems that make a child more resilient to stress and illness. Some parents withdraw their children from swimming classes when the temperature drops believing it will help avoid illness. This is actually an old wives’ tale. Children who swim throughout winter are far less likely catch far less colds and flu. Swimming has been proven to assist in brain development. For school-aged children, it is regarded as a vital part of their development of academic performance. It also helps with coordination, motor skills, balance, and concentration. During the winter months, children get restless since they aren’t running and playing outside. Swimming is a great way to remain fit, and it is a way to keep their energy levels maintained without being outside in the cold. 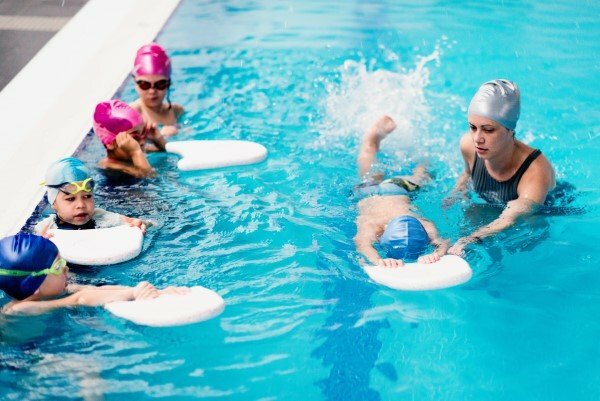 Accidents can happen at any time of the year in the water, so it’s important that your child understand how to handle water emergencies, how to stay calm, and confident in the water. When you keep them in swimming lessons throughout the winter, it helps to reinforce their swimming and safety skills so they are prepared if something does go wrong. As you can see, keeping up regular winter swimming lessons has excellent benefits. You want your children to be confident in the pool in your backyard.